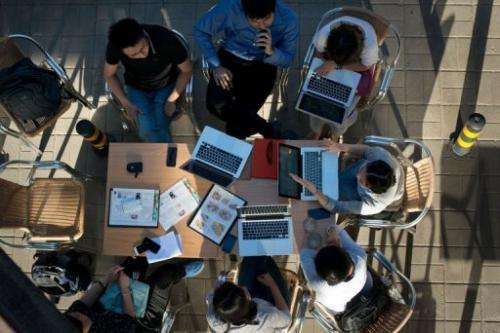 People group around laptop computers at a cafe in Beijing on May 29, 2013. Passwords have proliferated so much that it's a daily struggle for users to cope with dozens of them—often across several devices. And besides, with technology growing by leaps and bounds, why does the username-and-password formula—a relic of computing's Jurassic era—remain the norm? "The incredibly short answer is, it's cheap," said Per Thorsheim, a Norwegian online security expert and organizer of PasswordsCon, the world's only conference dedicated to passwords, taking place in Las Vegas in July. "If you want anything else—if you want some kind of two-factor authentication that involves using a software-based token, a hardware-based token or biometric authentication—you need something extra," he told AFP. Passwords have thus proliferated so much that it's a daily struggle for users to cope with dozens of them—and not just on one personal computer, but across several devices. 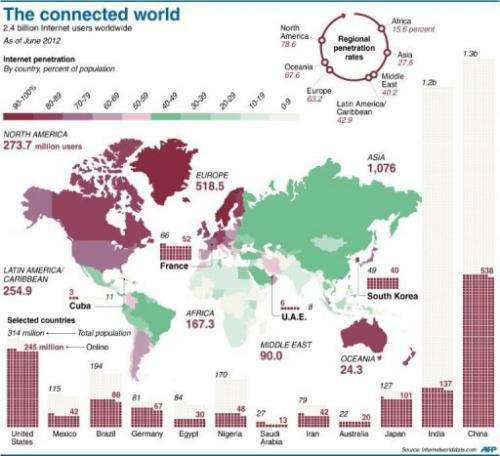 Graphic showing the percentage of national populations connected to the Internet. In a 24-nation survey last year, Norton found that 40 percent of users don't bother with complex passwords or fail to change their passwords on a regular basis. Rival security app firm McAfee says its research indicates that more than 60 percent of users regularly visit five to 20 websites that require passwords, and that a like-sized proportion preferred easy-to-use passwords. The most popular passwords, infamously, are "password" and "123456," according to Mark Burnett, whose 2005 book "Perfect Password: Selection, Protection, Authentication" was among the first on the topic. 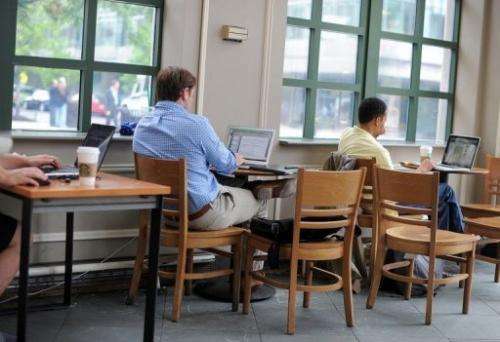 People use their laptop computers at a Starbucks in Washington, DC, on May 9, 2012. Norton found that 40 percent of users don't bother with complex passwords or fail to change their passwords on a regular basis. Within seconds, Windsor had one-third of its passwords. Within minutes, he had another third. "I also won a bet by finding the 'super secure' password of a colleague in less than five minutes," he told AFP by email. Google is toying with the idea of users tapping their devices with personalized coded finger rings or inserting unique ID cards called Yubikeys into the USB ports of their computers. "These (biometric) technologies are coming to a place where they are highly mature, cost effective and in a position to roll out into the consumer market today," FIDO's vice president Ramesh Kesanupalli told AFP. For now, many Internet services are embracing two-factor authentication, that challenges users with a bonus security question—like "What is your dog's name? "—or emits a one-use-only numeric code via SMS messaging. Google "hashing algorithm". For many years a best practice employed by most sites that have to store passwords securely. Anyways, that's not by a long shot the only way passwords can be stolen. As alfie points out: Passwords are NEVER stored on a system in plain text. - if a match exists you're in. Finding good hashing functions is a science in itself. They must be conflict free and hard to reverse. Old car licence plates are easy to remember and are alphanumeric. Use unusual words/acronyms from your chosen type of employment. A chemist would use chemical compounds for instance, or something like the chemical name for "sugar"! Not C12H22O11 but..